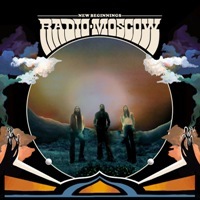 When we see the cover artwork of Radio Moscow’s ‘New Beginnings’, it is right away clear: this California based trio comes straight from the sixties and seventies. They already have quite a record of service. In ten years time they released several albums, of which the anthology ‘Live! In California’ could be seen as the closing of a chapter. Now they are picked up by Century Media and the new album is suitably called ‘New Beginnings’. This launching at the world is serious. When you read this, the band has already toured intensively in Europe in September and October. The trio is made up of vocalist/guitarist Parker Griggs (also co-producer), bassist Anthony Meier and drummer Paul Marrone. Thus a core line-up, characteristic for bands such as Cream and The Jimi Hendrix Experience as well. Exactly in that direction we can place the musical style. Add firm elements of Ten Years After, since the tight-as hell foundation of the rhythm section and the solos with blues injection often remind me of them. It was clear from the very outset with opener ‘New Beginning’: this band knows how to build a steamy party! However, the songs are compact, even though they brim with vintage effects like wah-wah, fuzz and all kinds of stuff from that era. Psychedelic distortion isn’t strange to them either (‘New Skin’), while ‘Pacing’ reminds me a bit of Wolfmother – one of those successful ruminants among the vintage bands – but with a less irritating voice. A moment of reflection happens to be the beautiful, soaring ‘Pick Up The Pieces’ with emotive chants, followed by the final ‘Dreams’ in which they cut loose again in fervent soloing. Somewhere I have read that this is a hectic record. I really don’t experience it like that. On the contrary, the whole thing breathes virtuosity, but only to serve the complete picture. I think they did not hear the so-called djent bands then… that’s hectic! Well alright, hopefully their dreams will come true on this world-wide adventure, their trip to the roots has taken a sparkling new start and we can applaud that to the max. Wanneer we de cover van Radio Moscow’s ‘New Beginnings’ onder ogen krijgen is het alweer duidelijk: dit trio uit Californië stapt rechtstreeks uit de jaren zestig en zeventig onze woonkamer binnen. Ze hebben al een behoorlijke staat van dienst en brachten in tien jaar tijd ettelijke albums uit, waarvan de bloemlezing ‘Live! In California’ als de afsluiting van een hoofdstuk gezien mag worden. Nu zijn ze immers opgepikt door Century Media en het nieuwe album heet onverbloemd ‘New Beginnings’. De lancering kan tellen, want wanneer je dit leest is er in september en oktober al intensief getoerd in Europa.